A gobo is a stencil or template placed inside or in front of a light source to control the shape of the emitted light. Lighting designers typically use them with stage lighting instruments to manipulate the shape of the light cast over a space or object—for example to produce a pattern of leaves on a stage floor. 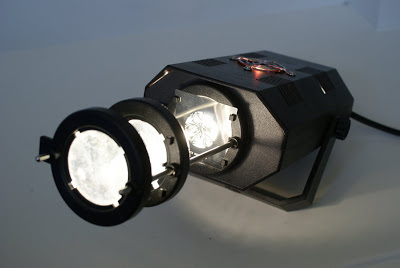 A decorative lighting device that projects a gobo. Components from right to left are the lamp house, the gobo itself (a grid made of wires), and the focusing lens. In a theatrical unit, all three would be in an enclosure to prevent light spillage. The insert at lower right shows the pattern this device projects. The spacing of the gobo and the lens can be varied to alter the size and focus of the image.